Wei Chen is the first recipient of the District 204 BMO Harris Bank Volunteer of the Month award. Chen has volunteered every Tuesday afternoon for the past five years at Graham Elementary School. She was nominated by Cathleen Janek, Vice President of the Graham Elementary School PTA. In her nomination letter, Janek said that Chen is not like most volunteers you meet at elementary schools because she doesn’t have children who attend the school and never did. Her only connection to Graham was that it seemed to be the only school she noticed when she first moved to her home in 2007 and it was within walking distance of her house. One day, on her usual daily walk past the school, she stopped by and asked if they needed volunteers because she wanted to make a contribution to her community. At Graham, she is known as “The Book Doctor” because she meticulously repairs ripped or torn library books, making them look shiny and new again. Chen, 57, said she is humbled and surprised to be chosen as the Volunteer of the Month. Before she moved to Naperville, she worked in the Houston Public Library for seven years. In addition to working in the library, she taught Chinese to children in an after-school program. The Graham Library Media Center was a perfect place for her to volunteer because she loves books. She also loves education and working with children because in China, she was a teacher. BMO Harris Bank donated $1,000 to Graham Elementary School in honor of Chen. 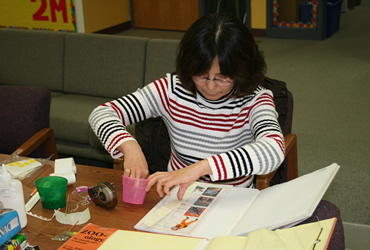 Volunteer Wei Chen is known as "The Book Doctor" at Graham Elementary School.